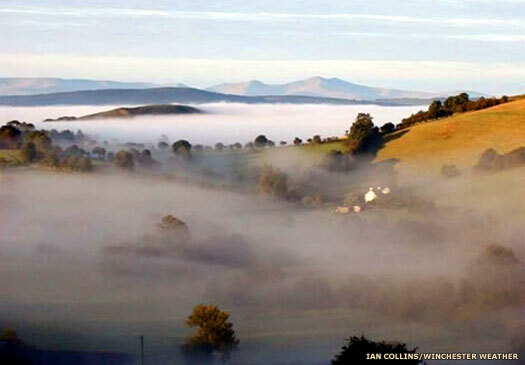 This tiny post-Roman region was located in central Wales, between Builth to the south and Powys to the north. It seems to have been part of Vortigern's ancestral lands, and it bears his name in its Welsh form - Gwrtheyrnion (or Gwerthrynion, the modern spelling), which was rendered into Latin for the Historia Brittonum as Guorthigirniaun or Guorthegirnain (the latter is sometimes shown as ending in an 'm', but this would never have happened. It could be a transcription error, either by earlier clerics or modern scholars). Gwrtheyrnion's key town was Rhaeadr Gwy (perhaps better known as Rhayader). This later formed the county town of Sir Faesyfed (the historic country of Radnorshire). Although detail about Vortigern is hard to come by, and is open to much speculation, it seems likely that he became the supreme authority in post-Roman Britain by the second decade of the fifth century AD. Tradition states that he subsequently devolved authority in the land of the Pagenses (early Powys) to his sons, handing each of them control of a portion in the form of Gwent, Builth and Guorthigirniaun. His second son, Cadeyrn Fendigaid, succeeded him in the Pagenses itself, ruling in his name during much of his lifetime. Guorthigirniaun seems to have been governed entirely by Builth and was subject to its rule. Normally that would suggest that the son of Vortigern who inherited it either did not survive long or did not produce an heir to inherit his territory, but in this case the son who held Builth was the same one who held Gwrtheyrnion. So however it happened in detail, Builth's rulers were Gwrtheyrnion's rulers, and all of them could trace their descent to Vortigern. Unfortunately information on the region is extremely patchy. In its early days it seems to have been regarded as a principality. By the time that charters and the like were being signed it often appears as a cwmwd (or cymwd in those early documents). This was a later, smaller sub-division of the original smallest unit of territory, the cantref. The medieval Middle Welsh form of this word, was cymwt which transferred into English as 'commote', used to refer to a secular division of land rather than a principality. The principality of Gwrtheyrnion seems to have been formed by now, and possibly as early as AD 425 or so, when Vortigern is presumed to devolve regional authority to his sons while he governs the island of Britain. The minor kingdom of Maelienydd is also formed, although a little later. It consists of what seems to be a cantref - a standard division of territory - that is detached from the Pagenses (early Powys). Gwrtheyrnion borders it to the west and Powys surrounds it to the north, east (truncated by Offa's Dyke about three hundred years later), and south. By now the newly arrived Jutish foederati have seen how weak are the British defences and begin a takeover of the kingdom of Ceint, aided by the many older foederati settlements in key areas of the land. As the east of the island is engulfed by the chaos of the foederati revolt, later tradition (mostly contained within the Historia Brittonum) states that High King Vortimer is poisoned while Vortigern flees to the province of Guorthegirnain, so called from his own name, where he conceals himself with his wives: but Germanus follows him with all the clergy of the British Church, and upon a rock prays for his sins during forty days and forty nights. Vortigern returns to battle briefly before fleeing again and being put to death by Ambrosius Aurelianus. One of the results of the messy situation in the east and the death of Vortigern is that Gwrtheyrnion now passes to his sole surviving (legitimate) son. Nennius states that this is 'granted' by Ambrosius Aurelianus, but it is probably little more than a rubber stamp. Pascent governs the principality directly from Builth, although he has probably already exercised regional control over it from the point at which it had first been divided from the Pagenses. In fact, it would seem that Pacent is already deceased by this time and that it is his son, Braciat, who now governs Built and Gwrtheyrnion - a fine detail that may have been lost to some chroniclers. The fate of the last king of Builth is unknown, as are any firm dates for his life and reign. A rough estimate is that he is dead by AD 800. Afterwards, Builth and Gwrtheyrnion cease to exist as separate Welsh territories in their own right, being absorbed by Seisyllwg and then Deheubarth. The precise circumstances and process by which this happens are unknown. In the sixteenth century Gwrtheyrnion becomes part of the new county of Sir Faesyfed (Radnorshire).